* Add a flash video player to your website. No coding skills or flash knowledge is required. * Professional flash video player template designs, customize easily using A4Desk website movie software. * Import multiple video files and automatically create video playlist. * Host your flash video files on local server for maximum copyright protection, privacy and security. Creates Flash MP3 player for your website and CDROM. 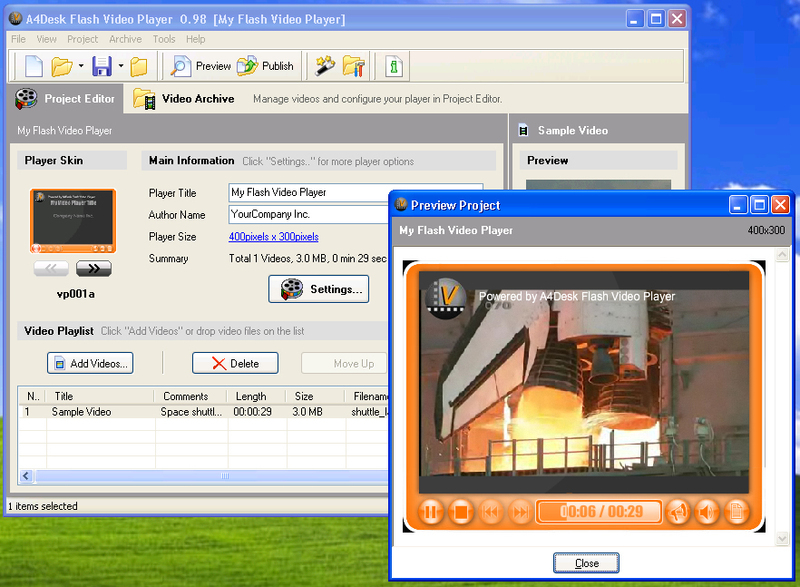 Flash Video MX is a easy-to-use yet powerful tool to convert video to flash. Plays all files with FLV extension (*.flv), and play FLV videos. A handy flash tool kit designed to download and play macromedia flash movies. Qweas is providing links to A4Desk Flash Video Player 2.92 as a courtesy, and makes no representations regarding A4Desk Flash Video Player or any other applications or any information related thereto. Any questions, complaints or claims regarding this application A4Desk Flash Video Player 2.92 must be directed to the appropriate software vendor. You may click the publisher link of A4Desk Flash Video Player on the top of this page to get more details about the vendor.